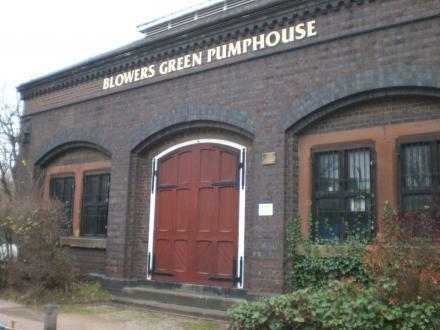 Blowers Green Pumphouse is a place on the waterways minor waterways place place on the waterways major waterways place village town city on the Birmingham Canal Navigations (Dudley Canal No 2 - Coombeswood ) between Parkhead Junction (Junction of Dudley Canals Nos 1 and 2) (a few yards to the west) and Dudley - Bumble Hole Junction (Junction of Dudley Canal No 2 and the Bumble Hole Branch Canal) (2 miles and 3¼ furlongs to the east). The nearest place in the direction of Dudley - Bumble Hole Junction is Blowers Green Bridge; ¼ furlongs away. Facilities: chemical toilet disposal, rubbish disposal, toilets and water point. The place is a Wharf and a Temporary Moorings. Unit G6 Shaw ROad, Dudley, DY2 8QX — 1109 yards to the northeast. Unit 27 Thornleigh Trading Estate,, Dudley, DY2 8UB — 329 yards to the north. Unit 1D Unicorn business park, Ripley — 1241 yards to the south. sparrowhawk fold, Dudley, DY12LQ — 1523 yards to the northwest. Queens Cross Mosque... 29 - 30 Queens Cross Road, Dudley, DY1 1QU — 1199 yards to the northeast. Wolverhampton — 1398 yards to the northeast. Level Street, Brierley Hill, DY5 1XE — 237 yards to the northeast. Unit 1, Stafford Street, Dudley, DY1 2AA — 1590 yards to the northeast. Netherton — 1395 yards to the southeast. Woodside — 1389 yards to the west. The Gateway, Brierley Hill, DY5 1LJ — 1229 yards to the southwest. Unit 3, Vine Street, Brierley Hill, DY5 1JE — 1141 yards to the southwest. Garrat Street, Brierley Hill, DY5 1JU — 1374 yards to the southwest. High St, Dudley, DY1 2HQ — 1581 yards to the west. Units 3 & 4, Bridge Trading Estate, St Peters Road, Netherton, Dudley, DY2 9HN — 1371 yards to the east. Pedmore road, Brierley Hill, DY5 — 1573 yards to the southwest. Dudley — 1157 yards to the east. Unit 16 , Queens Cross Business Park, Angel Street, Dudley, DY1 1TA — 1175 yards to the northeast. Dudley — 1122 yards to the west. Unit 12B Central Park ind est, Halesowen rd,, Netherton, DY2 9NW — 1290 yards to the southeast. 1590 yards to the south.